These are few and far between these days. 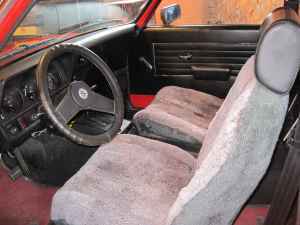 1975 was the last year a real Opel - badged as an Opel - was sold in the US. Essentially, this is a Manta sedan. It was never as popular as the Manta here in the US, but it was a very good car. The engine was Opel's tried and true cam-in-head 1.9 liter 4. In 1975 (and only 1975 in the US) the engine was fuel injected. In this form, the engine moved the car to 60 MPH in a little over 12 seconds. This Ascona hasn't run in "several years". The body has been repainted and looks very good. The only negative to this car - besides it not running - is the automatic transmission. Opels are fairly durable cars and parts are still plentiful in Europe. Like most 1970s European cars, rust was a big issue. Any repainted car should be checked thoroughly for poor rust repair. This is a cool old car that you could drive often and bring to shows. Located in Springfield, OR, click here to see the Craigslist ad. Always liked the Ascona. To me they are better looking and more interesting than the manta or kadett. They sort of have a muscle car look to them. Too bad this one is a 1975, the 1973 and earlier ones have the nicer chrome bumpers. 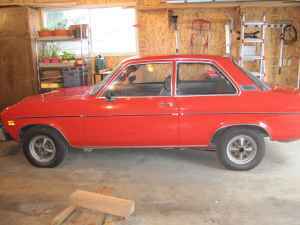 I had a 1975 Ascona that was a really nice car that had been maltreated by the previous owner. It was my fourth or fifth Opel and the only one with fuel injection. The battery was weak enough that if the car didn't start right away, the starter drew the voltage down low enough to keep a particular relay from picking correctly, and the car wouldn't start at all. For about two weeks (while I saved up to buy a battery) there was a ritual where I would pry the top off the relay, insert a sliver of cardboard as a shim (a matchbook cover seemed to be the right thickness) in between two contacts while someone else would crank the starter. At a certain point, I would yank the shim out and the car would start. Mine was a four-speed and, except for the solid rear axle, reminded me very much of the BMW 2002 my boss drove. The Ascona was another case where GM just got a car sorted out right, and then cancelled it.